Top wing center section is ready for trim tapes. The root ribs were covered first, followed by the bottom of the wing then the top. The #4 stainless truss screws are working nicely, easy and quick to install. Because there are no washers under the screws, care must be taken to prevent distorting the tape when tightening down to snug. I use a cordless drill on low speed with minimum clutch torque. Spacing is 3" on all surfaces. 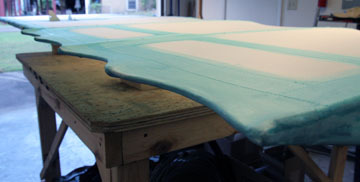 In spite of adding reinforcements to the root ribs, the fabric still deformed the top tubes even with only a 250F shrink. Ultimately this won't be much of an issue because root fairings will cover the gaps between wing panels. But I may add more bracing to the root ribs of the other panels. Putting finishing touches on bottom right wing panel. A couple of "problems" have arisen in the course of covering this panel but they will be addressed with the other three panels. Every other wing rib is a half-rib. I first applied the bottom fabric and gave it a mild shrink to pull out wrinkles. However, this was enough to distort a half-rib and pull the trailing edge out of line. From now on I will attempt to shrink fabric equally top to bottom to prevent the trailing edge from wandering. If building another one of these planes I would build a full rib for each station. The light structure of these wings is more susceptible to distortion than many builders would expect. This is not a fault of the structure, the builder just needs to be alert to areas where shrinkage might result in distortion and not push the same heat into the fabric as might be done on a heavier airframe. One of the tip bow braces (my design) collapsed from a 250F shrink and I had to open up the fabric for repair. I will reinforce these braces on the remaining panels. Covering is complete. Just over two quarts of EkoBond and 47 yards of 2.7oz uncertified fabric was needed along with an assortment of 1", 2", 3", and 4" pinked tape. 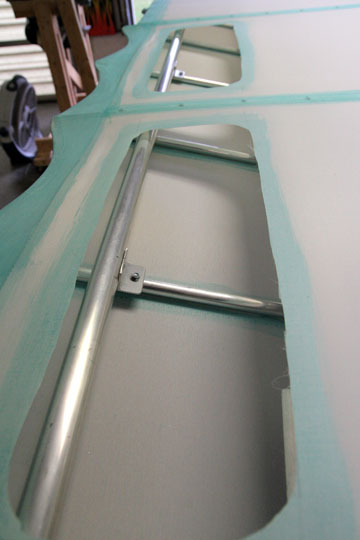 Just under 800 #4 screws secure the fabric to the airframe along with one roll of reinforcing tape. The only major hiccup encountered had to do with the half-ribs distorting after the fabric was shrunk. Some distortion is evident on the bottom wing panels as noted above, but the first upper panel I covered suffered serious distortion. 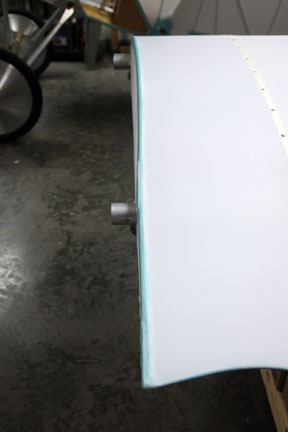 The copper tube trailing edge serves to form the Fokker scallop but offers no structural strength. 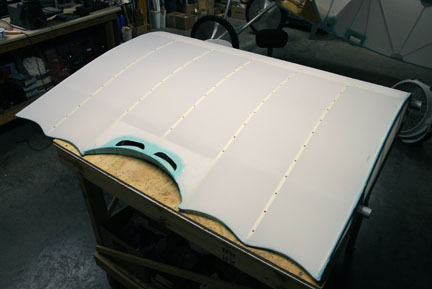 This photo illustrates what happened on the first upper wing panel. 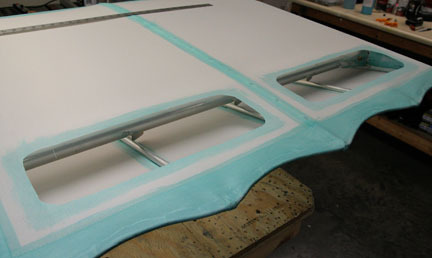 The fabric on the bottom of the wing pulls the single tube half rib down and out of line with the full ribs. The best solution is to have all full ribs but this was not an option at this point unless I wanted to rebuild both wings. 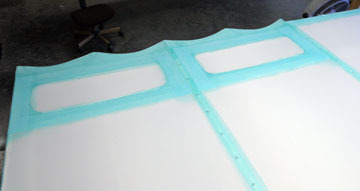 After considerable thought on how to address this matter not only on the uncovered panel but also the one already covered, I added a false spar to the second upper wing panel prior to covering. This tube is trapped by the full ribs and supports the half ribs so they can't be pulled down out of line by the fabric on the bottom of the wing. 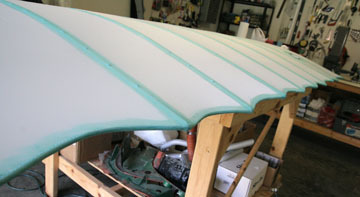 Here is the first panel with the bad trailing edge. EkoBond was applied to where the cuts would be made so the edges wouldn't fray and the openings have rounded corners to prevent introducing stresses into the fabric. I cut two access holes that also relieved the stress on the half ribs so they could be pulled back into proper alignment. The holes were located so patches and trim tapes would align with the tapes already in place. 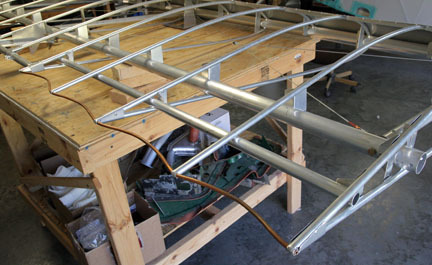 A false spar was worked into the cavity and secured with aluminum angles. My biggest concern was whether or not I could regain the tension on the fabric that was lost when the holes were cut. Here are the holes with patches in place and tapes sealing the edges. 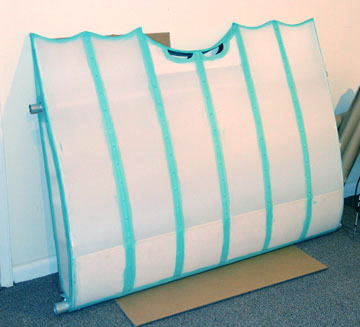 Once the patches were shrunk and the remainder of the panels re-ironed satisfactory tension was regained. Success. 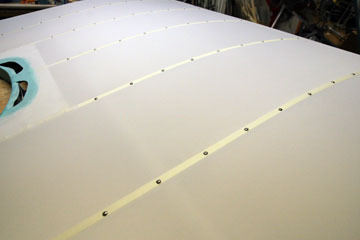 The trailing edges of all ribs are now in good alignment and the wing will not need to be recovered. This is an example of how we sometimes must deal with unexpected problems in a build, even when the issue seems at first not to have a practical solution. A couple of days mulling over possibilities will often prompt thought in a direction that was not first considered. 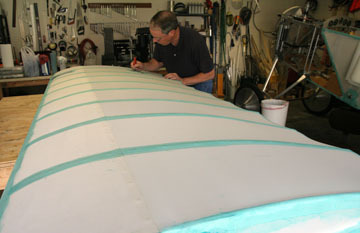 My first impulse was to strip all the fabric off the two large sections of the wing with the half ribs. But upon further consideration I decided I could live with the two small repairs on the bottom of the wing. They will always serve as conversation pieces about the time I salvaged a badly distorted wing and pressed on with the project. They will look just fine from the cockpit as the ground slides by 1000' below the wings. Building an airplane is often a process of solving problems as they occur. The journey is often as interesting as the destination.